AbortionClinics.ca - View a Preborn baby on 4D! Life begins at fertilization, when the sperm and the female egg cell or ovum, meet to form a single cell. A new human life is created, different from his/her mother or father, different from any human being that has ever lived or ever will live. This new human life is totally unique, and has his/her own genetic code that will determine the characteristics he will have for the rest of his life. Within one week of fertilization, the new human implants in the mother's uterus and is nourished there for the next nine months. At three weeks, the baby's heart begins to beat. A microscope would reveal that this little baby has the characteristic 46 human chromosomes in every cell, demonstrating clearly that this is a human being. This 8 week old unborn baby swims freely in the amniotic sac with a natural swimmer's stroke. The mother won't feel him yet though until about 4 1/2 months into the pregnancy. At this age the baby is approximately the length of your thumb. He responds to painful stimuli, such as a needle prick, will grasp an object and make a fist. Each organ is present. The heart beats sturdily, the stomach provides digestive juices, the liver makes blood cells and the kidneys begin to function. At 12 Weeks, the baby is very active! He can kick his legs, curl his toes, squint, turn his head, open his mouth and swallow. By 16 weeks, the baby is 5 1/2 inches long and weighs nearly a pound. Fine details of development are present such as fingernails and eyelashes. Throughout his time in utero, the unborn child is nourished with food, water and oxygen by his mother through the placenta. At 18 weeks, the baby’s nostrils and toenails become visible. The baby may such her thumb, turn somersaults, and has a firm grip. The ovaries of girls contain the beginnings of eggs. She begins to develop her own sleeping habits. By 20 weeks, unborn children are capable of feeling pain and likely feel pain much earlier. Dr. Maureen Condic, an expert on human embryonic development and Associate Professor of Neurobiology and Anatomy at the University of Utah, has testifed that the neural circuitry responsible for the most primitive response to pain, the spinal reflex, is in place by 8 weeks of develoment. By 22 weeks, the baby is kicking, turning, and hiccupping. Mom may be able to identify a bulge as an elbow or the baby’s head. The testes descend in boys. At this point in the pregnancy, each side of the brain has a billion nerve cells. At 26 weeks, the child sleeps in her favourite positions, and stretches upon waking up. By weeks 27, the baby will be able to hear. At 30 weeks, the baby weighs about 3 lbs, 5 oz. Her eyelids begin to open and close, preparing her to see outside the womb. Even her eyelashes are developed. At 34 weeks, the child’s skin becomes pink and smooth. The pupils of her eyes respond to light, and her fingernails reach right to the tip of her fingers. Measuring about 12 inches and weighing about 5 lbs, the baby is really getting cramped now. 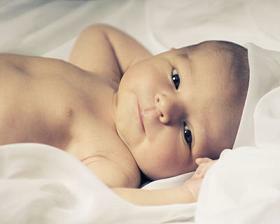 At 40 weeks, the baby triggers labour and is born, usually from 264-270 days after conception.